Yield: Yields about 4-6 tacos depending on how full you stuff them and whether or not you add cheese. 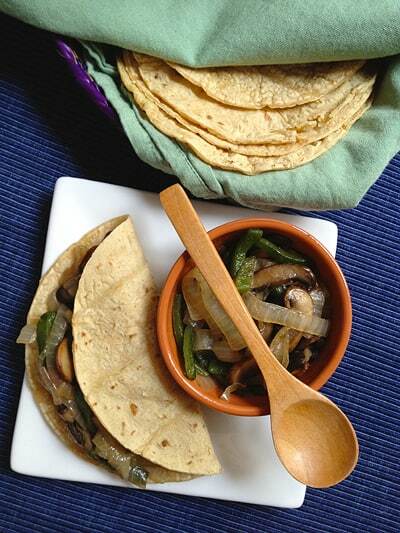 Hearty vegetarian tacos with mushrooms, poblano chiles and onion. In a saute pan, melt the butter over medium heat and add the onions. Stir them to coat and cook until they start to turn transparent. Add the mushrooms and saute until they start to give off juice and change color, indicating they're getting tender and juicy. Add the chile strips and stir to coat, then add the kosher salt. Allow to saute for about 5 minutes over low heat and serve with warm tortillas (corn or flour, whichever you prefer). Optional: Add a little shredded cheese, such as Chihuahua or Oaxaca, and cook on a comal to make a tasty veggie quesadilla. 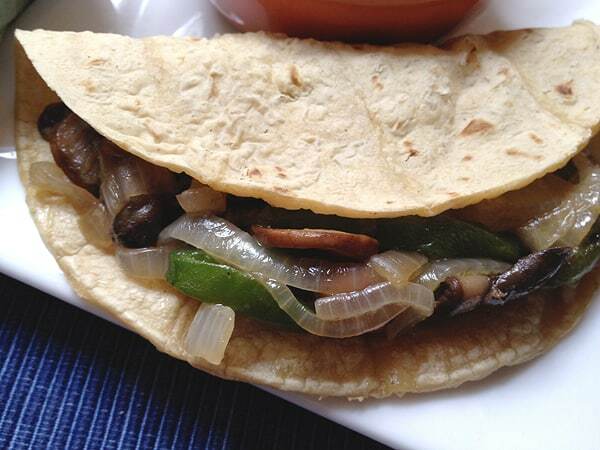 What’s your favorite kind of vegetarian taco? Hi! I love seeing recipes for vegetarian alternatives! My girlfriend is vegetarian. I am half vegetarian: only when cooking at home, I like meat. I have found that Soyrizo is a staple for mexican cooking for us and have actually come to prefer it to the real thing (depending on the brand). I’ve also found a Chipotle Sausage made by ‘Original Field Roast Grain Meat Co.’ that is on the border of being too close to meat for my girlfriend to eat. (They also make a spanish style chorizo that is pretty tasty). Many recipes can also be adapted using ‘meatless grounds’ or ‘Chickn Strips’, both of which are also staples in the house so I can get some of that meaty texture I often crave. The key is to find the best way to cook these products that are to your liking. I often find that cooking them longer than recommended so that they have a bit of crispiness is the key to getting them tasting good. Otherwise they can be soggy and the texture sees ‘off’ to my palate. Mexican cuisine, I feel, is a perfect match for these products. I would love to see more recipes incorporating them as well as wonderful recipes such as the above for vegetarian offerings. Thanks for the recipe!